We are very excited about the newest member to join our MedSpa here at Summit Plastic Surgery & MedSpa, Licensed Esthetician, Heather Mock. Heather is a state licensed and CIDESCO certified esthetician who graduated at the top of her class from Independence College of Cosmetology in 2007 with over 1500 hours of skin care training. She is also certified in beauty makeup artistry from the Makeup Designory in Los Angeles. 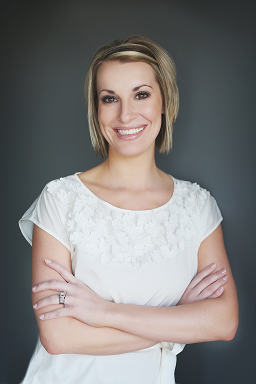 Heather has worked in the medical esthetics field since 2007. She is very happy to be a part of our wonderful team at Summit Plastic Surgery & MedSpa. Heather has a true passion for the esthetics industry and is looking forward to expanding her knowledge while staying up to date on the newest treatments and products available today. She believes in developing and keeping a close relationship with her clients all while giving them quality treatments and honest recommendations on the perfect treatment plan and regimine for them. Heather is currently offering many great treatments in our Kansas City area office, such as, Visia Skin analysis consulations, a wide variety facials(including our amazing Fire & Ice facial), microdermabrasion, chemical peels, dermaplaning, BBL, Laser treatments, NovaLash Eyelash Extensions, Fantasy Tan Spray Tanning, Makeup Applications, Laser Hair Removal, Skin Tyte and even eyelash and eyebrow tinting and eyelash perming. Heather believes that working for a plastic surgeon is the best option for an esthetician and is very excited to be working with Kansas City Plastic Surgeon, Dr. Matt Chhatre. She has been fully trained on all procedures performed by Dr. Chhatre at Summit Plastic Surgery & MedSpa and can give great insight as to which cosmetic surgery or injectable procedures would be the best compliment for each person and help lead them in the right direction to achieve their personal beauty goals. If you would like to learn more about what would be your best skin care option contact Heather today to schedule your complimentary skin analysis.